Purify your bathing routine with an all-natural extra cleansing boost in this black beauty of a soap bar, selected as an Eco-Excellence Award Finalist! 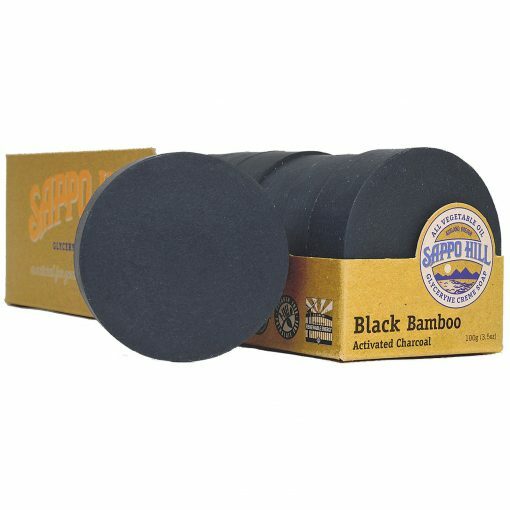 Sustainably grown steam-activated bamboo charcoal has increased surface area and micro-pores, enhancing the ability to naturally lift and wash away dirt, debris, excess oil, and impurities. When you use this black soap bar, fine charcoal particles lightly massage clarifying your skin & leaving it feeling purely fresh & clean. A facial, hand, or body soap, can also be used as an effective shampoo bar for oily scalp & hair. A gentle yet powerful deodorizer, great for the kitchen, too! Non-GMO food grade oils of sustainable palm and coconut, water, sodium hydroxide*, glycerine, activated bamboo charcoal. *Used to make true soap; none remains in fully saponified and superfatted soap bar.